Magnificent 7 Bedroom, 5500 sq feet, 2 story private Beachfront House. 5 Bedrms Main House (ensuite baths) plus 2 Bedrms in Guest Cottage. Directly on ocean, heated pool, Media Rm w/ HDTV, (WIFI Internet/Printer/Copier/US & Local Phone). Spacious Outdoor Area - kayak & paddle board. BBQ on outdoor patio.. Awesome setting for group of friends or families. Located 15 minutes from Airport. Walk to Baha Mar Resort & Casino, fine restaurants. Short cab ride to Atlantis, attractions, duty-free shopping and downtown straw market. Grocery store 10 mins from house. Ideal climate for recreation, leisure, or a corporate retreat. Shangri La (meaning heaven on earth) features: year round sunshine, white sandy beaches, and calm, crystalline water. Housekeeper provided a few hours midpoint with a weeks stay. Gardener and pool maintenance onsite a few days a week. We update the availability calendar regularly, so feel free to check dates you wish to travel against dates already booked. Special rates will apply for holidays. Property Features: Property also has a separate Guest Cottage with 2 bedrooms, bath, kitchen, living room. The outdoor area is spacious with private pool, comfortable terrace furniture including 2 seating areas with large tables, couches, chaise lounge chairs, and outdoor speakers. Ideal for the corporate executive - all the bells and whistles - hi speed Internet connection, phone (local & US Vonage line), copier, printer. Great for entertaining - Media Room with 6 reclining theater chairs, huge big screen TV with surround sound system, cable. Local Attractions: Queen's Staircase, Forts Fincastle & Charlotte, Ardastra Gardens & Zoo, Graycliff Cigar Factory, downtown straw market, Atlantis Casino & waterpark, Marina Village, Junkanoo Festival. Swim with dolphins and explore beautiful coral reefs. Island excursions & helicopter tours available. Half day or full day Out Island trips recommended to Exuma and Harbor Island. 15 min walk down beach to Baha Mar Resort. 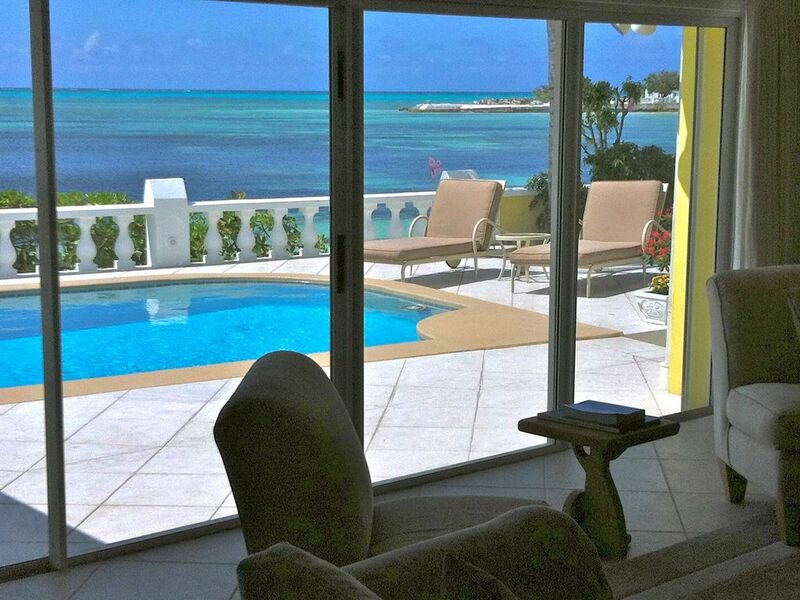 Perfect Environment: Enjoy Breathtaking Ocean Views, Bahama breezes, and the welcoming nature of the Bahamians. See for yourself -- have fun in Paradise -- take in a piece of heaven on earth at Shangri La. Intricate tiling and high end faucets add to the beauty. Bathroom 6 is in guest cottage. BTC wireless- wifi with booster through out inside and out. Large comfortable living room looking over the pool, patio and luscious waters. Sonos system with speakers adjustable on patio, kitchen, dining room etc. Spacious patio with large eating area. Multiple other seating areas around pool and overlooking the beautiful blue water. Local property manager, housekeeper provided a few hours midpoint during a weeks stay and gardener/pool service onsite a few days a week. Special services such as babysitting, in home massage, personal chef, and catered meals can be arranged for a small commission. If available, economy car or 7 person passenger van can be rented from our local property manager for reasonable rate. The perfection on paradise. Shangri La has it all. What a great trip. We went diving each day and there was nothing like returning to a beautiful spacious home right on the water to relax and recover from the days adventures. From the house keepers to the hosts it was all first class. Ty again for the hospitality. We will absolutely book again!! I went to Shangri-La for a bachelorette weekend. The property managers could not have been more helpful answering questions, giving us advice for activities, and recommending restaurants. As the Maid of Honor, they took all the stress out of planning! In addition to the incredible management, words simply do not do this place justice. We enjoyed incredible sunsets, beautiful days on the beach and poolside with snorkeling, kayaking, and other rec toys toys included at the house. We can't say enough good things about the property, we'll definitely be back!! Can't get a better location, we've rented lots of houses, this was by far our favorite. Lots to do, nice comfortable beds, unbeatable location, we'll be back. We were an extended family of 13 that included my mother, her 4 daughters and spouses and 5 grandchildren in their 20’s. The house was perfect for our group. . . plenty of space especially with the guest house included. From the moment we reached out to book this house last September to the day we finished our vacation, all those connected to the house were superb to work with. A special shout out to the property manager who made booking this trip stress free. She was responsive, informative and so easy to work with. After answering a multitude of questions from me she was always happy to answer my “one more”. All those involved with the house in the Bahamas were equally friendly and easy to work with. They obviously have put together a great team who serve those who rent this house. The house was clean and ready for us when we arrived. Outdoor space was so fun. . . so inviting and we spent most of our time there hanging out and lounging around. Ample space for either sun or shade and so many things to do. . .swimming pool, hammock, paddle boarding, kayaking, ping pong table, lounge chairs. Walking the beach was part of our daily routine. Many in our group have been to Nassau before and understood how expensive food is. Therefore, we packed an entire suitcase + with food and brought two coolers with frozen meat. Throughout the week we used Cheryl’s taxi service. We arranged for a ½ day snorkeling trip from Captain Sam at West Bay Adventures. He and Captain Tyler picked us up right in front of the house. This was the highlight of the week for many in our group. Some in our group went to Atlantis Water park for the day. A group took the 1/2 day culinary academy at the Graycliff Hotel. This is a beautiful hotel with a 5 star restaurant. Don’t delay if you’re thinking of renting this house . . . You will not regret your decision . . . you will take tons of pictures, create amazing memories and have a trip of a lifetime!!! I hope we are able to go back someday!! I recently visited for a guys trip with friends and the property management made this stay exceedingly easy, allowing us to dedicate most of the time to relaxing. The facilities were amazing and everything was in top shape. The pool was set up for us and stayed warm and comfortable even in January. While I accidentally left a couple of valuable items in the house, the staff has helped us by promptly locating them and offering a safe return to us via fedex. We could not have chosen a better spot to stay. Thanks, Shangri La! The house was absolutely amazing, the views were breathtaking and such a relaxing treat to wake up to every early morning with the kids! I cannot say enough about the staff that we were able to meet and get to know a bit throughout our stay: Dee was absolutely FABULOUS -- she was incredibly helpful, super responsive and professional and you could tell she really cares about the property. Alesandro was also incredibly sweet and professional when he came by to take care of the pool. Charmaine was also very accommodating on our last day as we were trying to stay out of her way while also help make things as easy as possible for her. We chose not to rent a car during our stay, but needed to get out a few times to pick up groceries. Dee recommended a driver for us that we used (Gregory) who was the best. He took us to multiple grocery stores so we could find exactly what we needed for Thanksgiving. He waited while we shopped and helped us with our groceries too. He was extremely cost effective compared to calling a taxi and then calling another taxi after shopping. Sue was also so incredibly helpful and informative leading up to the trip -- the whole week from check-in to check-out could not have gone more seamlessly. It was also very helpful to have a crib, pack n' play, and highchair at our disposal since we had 3 small children traveling with us. A few other amazing details about the house: filtered water, an awesome TV room, more towels than you will ever need, close to multiple grocery stores and nextdoor to the new Baha Mar resort, paddle boards and a kayak at your disposal, an outdoor ping pong table, tons of pool floats for the kids, SONOS surround sound inside and outside (which made lounging by the pool even more fun), and direct access to the beautiful beach! Shangri La is an absolutely stunning property and we hope to return in the future! Excellent location - Cable Beach - Goodman Bay -West Bay Street - 15 minutes from airport - away from all the congestion of downtown Nassau. Baha Mar resort and 15 minutes from Atlantis.. ...The house is in a quiet, calm bay - right on the beach. ...Catch a jitney bus for $1.25 right outside the property that takes you into downtown Nassau. ...Smaller straw market, Casino, restaurants - 5 min ride away. ...Short walk down beach where you can rent jet skis or catch the Booze Cruise Boat that takes you on a half day adventure including a snorkeling stop. Golf: Jack Nicklaus course Baha Mar Resort - Cable Beach and Ocean Club - Paradise Island. Rates include all taxes. Until confirmed, rates are subject to change without notice. Check, bank to bank wire transfers, credit cards accepted. A 3-4% fee will apply when charging by credit card. Special rates apply for T-giving and Xmas holidays. See owner rental agreement for cancellation policy. DEPOSIT 50% of the gross rental fee required to hold reservation. Full and final payment (including a $500 refundable damage deposit) is due 60 days prior to guest's estimated time of arrival.